PAGEN FLOKI has been broken in and had two educational preps. We are leasing him out and also retaining shares ourselves in him, trainer has taken shares too. As soon as lease full he will come into work. His dam Storm broke a class course record at the Sunshine Coast on Cup day. 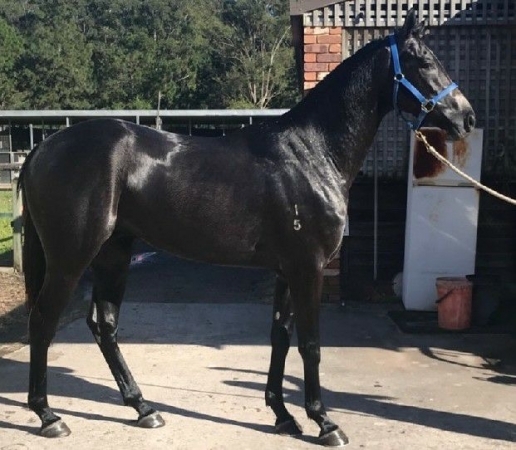 Don't let this boy slip by you as our trainer Robert Wilson on the Sunshine Coast has a huge opinion of him. Feel free to call him . 1 x 10% shares left, he is now offically in work and ready to trial. INSTINCTION (AUS) (Grey 2008-Stud 2013). 4 wins to 1500m, A$274,160, VRC Hilton Hotels S., L, MRC Zeditave S., L, Weekend Hussler S., L, 3d VRC CS Hayes S., Gr.3, MRC Regal Roller S., L. Out of SW De Lago Mist (VRC Sires’ Produce S., Gr.2). Sire of Paradis Imperial, Our Kingsman, Keen Instinct, Lota Creek Gold, Our Instinct and of the placegetters Epiction, etc. His oldest progeny are 3YOs. STORM, by Lucky Owners. Winner at 850m, 3d BRC Access Insulation H. Half-sister to Alezan Thunder. Dam of one foal. Delago Thunder. Winner at 2 in 2016-17 in Aust. Elysian Princess. Winner at 1150m in Aust. Stiff Thunder. Placed at 2 & 3, 2d ATC TAB Ipad App H., 3d ATC Blackwoods Alemlube 2YO H.
Quarck. 3 wins to 1200m to 2016-17, 3d SAJC Nicki Egerton Memorial H.
Elysian Thunder. Winner. See above. The Baker. 2 wins at 1000m, 1200m to 2017-18 in Aust. Fighting Teo. Winner at 1400m in 2017-18 in Aust. Connect Express. Winner at 1200m in Aust. Xaartee. 2 wins at 1200m, 1600m, TTC Rotary Club Central Launceston P., 2d TTC Lockwood P.
La Vie Esprit. Winner at 2, BRC Mitty's 2YO H., 2d BRC Jacob's Creek Sparkling H.
DESIGNS ON ROME (Holy Roman Emperor). Horse of the Year in Hong Kong in 2013-14. Champion Middle Distance Horse in Hong Kong in 2013-14 & 2014-15. 11 wins-1 at 2-from 1400m to 2000m, €55,420, HK$60,492,375, 1,101,000Dhs, to 2016-17, HKJC Audemars Piguet Queen Elizabeth II Cup, Gr.1, Citibank Hong Kong Gold Cup, Gr.1-twice, Longines Hong Kong Cup, Gr.1, Oriental Watch Sha Tin Trophy, Gr.2, Hong Kong Classic Cup, L, BMW Hong Kong Derby, L, Centenary Vase, L, Sha Tin Mile Trophy, 2d Curragh National S., Gr.1, Hong Kong Classic Mile, L, 3d HKJC Chairman's Trophy, L, Celebration Cup, L.
SIMPLE EXCHANGE (Danehill). 4 wins-2 at 2-from 6f to 1¼m, £18,438, €84,052, US$170,000, Arlington Park American Derby, Gr.2, Cork El Gran Senor S., L, Kempton Magnolia S., L, 2d Curragh Round Tower S., L, 3d Baden-Baden Preis der Sparkassen Finanzgruppe, Gr.3, Leopardstown Ballycorus S., Gr.3, Düsseldorf BMW Preis Düsseldorf, L, Leopardstown Challenge S., L.
SIGHTS ON GOLD (Indian Ridge). 6 wins-1 at 2-from 7f to 1½m, £115,503, €108,272, HK$3,000,000, 217,200Dhs, Sandown Brigadier Gerard S., Gr.3, 2d Cathay Pacific Hong Kong Vase, Gr.1, Ayr Scottish Derby, Gr.2, Curragh Royal Whip S., Gr.2. ROCK OF ROMANCE (Rock of Gibraltar). 5 wins from 2400m to 3200m, €95,281, 33,600sFr in France, Italy, Germany and Switzerland, Milan St Leger Italiano, Gr.3, 2d Hoppegarten Oleander Rennen, Gr.3, Milan St Leger Italiano, Gr.3, 3d Dortmund Deutsches St Leger, Gr.3. FICTIONAL ACCOUNT (Stravinsky). Champion Older Female Stayer in Ireland in 2011. 6 wins from 1m to 17f, £24,316, €82,232, A$22,300, Ascot Fenwolf S., L, Curragh Ballycullen S., L.
REKINDLED INTEREST (Redoute's Choice). 3 wins-1 at 2-from 1000m to 2050m, A$921,300, MVRC Dato' Tan Chin Nam S., Gr.2, AAMI Vase, Gr.2, 2d ATC George Ryder S., Gr.1, VRC Aurie's Star H., Gr.3, MVRC Chandler Macleod S., L, 3d MVRC WS Cox P., Gr.1, VRC LKS Mackinnon S., Gr.1, MVRC Dato' Tan Chin Nam S., Gr.2. WHERE WE LEFT OFF (Dr Devious). 7 wins from 1m to 9½f, US$291,039, Monmouth Matchmaker S., Gr.3, Calder London Lil S., L, 2d Saratoga Glens Falls H., Gr.3, Philadelphia Park Dr James Penny Memorial H., L. Producer. PORTICCIO (Lomitas). 3 wins from 1900m to 3600m, €75,401 in Ireland and France, Toulouse Grand Prix Inter-Regional des 3 Ans, L, 2d Grand Prix du Lion d'Angers, L.
Strong Commitment (Super Concorde). Placed in GB, U.S.A. and Germany, 2d Baden-Baden Zukunfts Rennen, Gr.2. GREY SWALLOW (Daylami). Champion 2YO in Ireland in 2003. Champion 3YO in Ireland in 2004 (Long). Champion Older horse in Ireland in 2006 (Int.). 6 wins-2 at 2-from 7f to 1½m, £15,000, €1,058,367, US$290,992, Irish Derby, Gr.1, Curragh Tattersalls Gold Cup, Gr.1, Hollywood Park Jim Murray Memorial H., Gr.2, Leopardstown Killavullan S., Gr.3, Two Thousand Guineas Trial, L, 3d Irish Two Thousand Guineas, Gr.1, Belmont Manhattan H., Gr.1, 4th Leopardstown Irish Champion S., Gr.1, The Two Thousand Guineas, Gr.1, Woodbine Canadian International S., Gr.1. Sire. MOONLIT LAKE (Deep Impact). 6 wins at 1600m, 1800m, 118,304,000¥, Fukushima TV Open, L, 2d Fukushima Mimpo Hai, L.
NIGHT STYLE (Night Shift). 3 wins at 2, Milan Gran Criterium, Gr.1, 4th Chester Vase, Gr.3. TERRY (Trusting). 2 wins at 2, A$76,650, in 2016-17, SAJC Oaklands P., L.
PARTNER SHIFT (Night Shift). 4 wins at 1350m, 1600m, £806, €77,850, QAR125,400, Nantes Grand Prix Anjou Bretagne, L, Longchamp Prix du Vert Galant. ESKIMO POINT (Lope de Vega). 6 wins to 1200m, €114,850, Milan Premio Cancelli, L, 3d Fontainebleau Prix Cor de Chasse, L.
TWILIGHT ROYALE (Testa Rossa). 3 wins at 2, A$495,750, VRC Sires' Produce S., Gr.2, ATC Inglis Nursery S., L, MRC (Mornington) Inglis 2YO Premier, L, 2d ATC TAB Number One Club 2YO P., Spotless 2YO H., 4th ATC Silver Shadow S., Gr.2. SENSE OF PURPOSE (Galileo). Champion Older Female in Ireland in 2011 (Long). 4 wins-1 at 2-from 1m to 1¾m, £8,964, €122,214, Leopardstown Ballyroan S., Gr.3, Challenge S., L, 2d Cork Noblesse S., Gr.3, Curragh Flame of Tara S., L.
MISS YOU TOO (Montjeu). 2 wins-1 at 2-at 7f, 10¼f, £116,412, €36,825, Yarmouth John Musker S., L, 3d Criterium de Saint-Cloud, Gr.1. COVERT LOVE (Azamour). 5 wins from 2000m to 2400m, £143,645, €460,560, Irish Oaks, Gr.1, Longchamp Prix de l'Opera, Gr.1, Newcastle Hoppings S., L, York Infinity Tyres Fillies' S., 2d Yorkshire Oaks, Gr.1, 4th Ascot British Champions Fillies & Mares S., Gr.1.